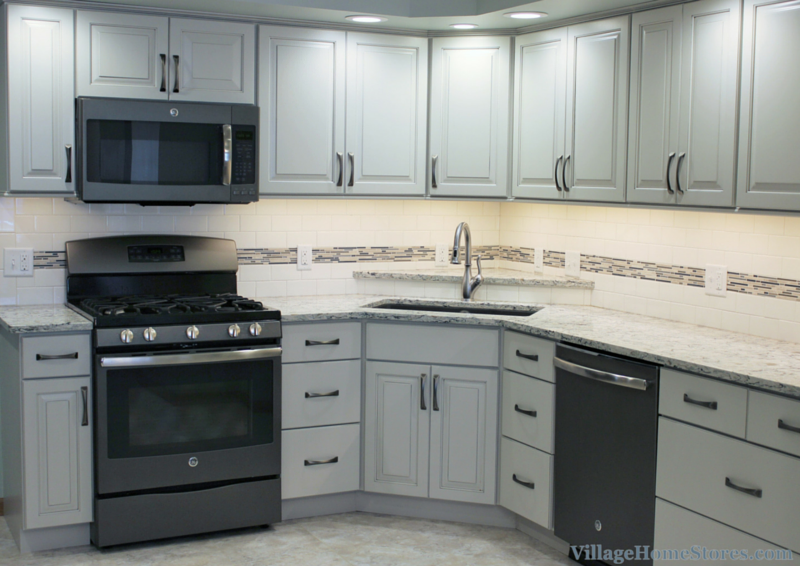 This kitchen remodel in Eldridge, IA has been transformed from dated oak to a cool neutral tone of materials. Another great example of how simply updating your layout and materials can give you an entire new space without any major construction. This L-shaped layout is large enough to accommodate an island or even a portable island if one is desired in the future. For this Eldridge, IA couple it is perfect leaving the open space. Cabinetry from our Dura Supreme line has been painted a “Pearl” finish and a “Slate” accent has been applied with a low sheen. The “Kendall” doorstyle from Dura Supreme is a great choice for an accented finish. Allowing the raised center panels of the doors to be highlighted with the “Slate” color. 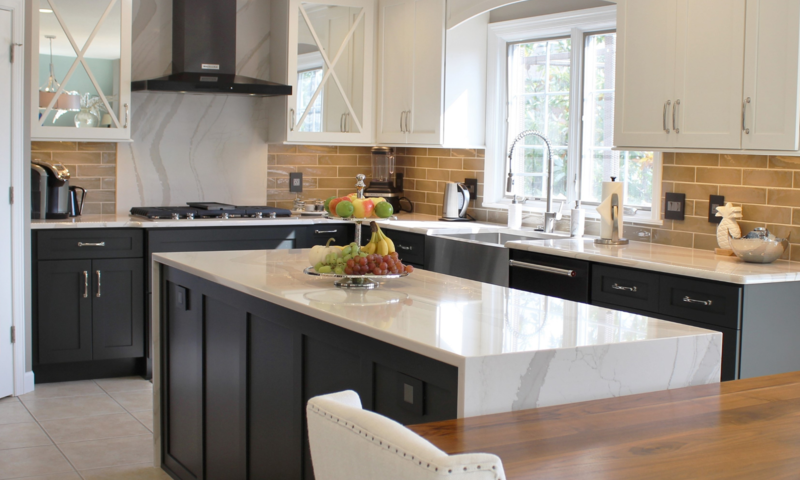 We absolutely love the countertop selection made for this project. Do you favor brighter whites and a hint of grey? Thinking of adding a “spa-blue” paint color to your walls or accessories? The subtle blue green color that runs throughout these Cambria Quartz “Praa Sands” tops might be perfect for your project! Proof that you can keep a “neutral” color palette and still introduce color into your space. The customers mentioned that they loved accessorizing it with WInter and snow elements and look forward to popping some blue accents in for Spring. 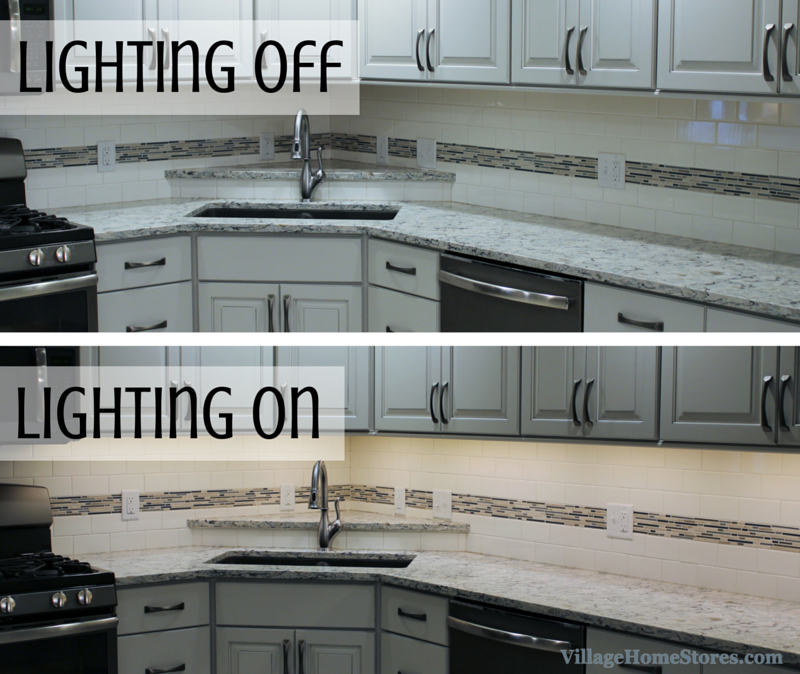 You know we can never pass up an opportunity to show you just how amazing our Diode LED undercabinet lighting is. Even in the middle of the day in a bright white kitchen like this it makes a world of a difference. It perfectly shows off the space and gives you an incredible wash of light for tasks at the counter. A backsplash tile has been installed along the entire L-shape. 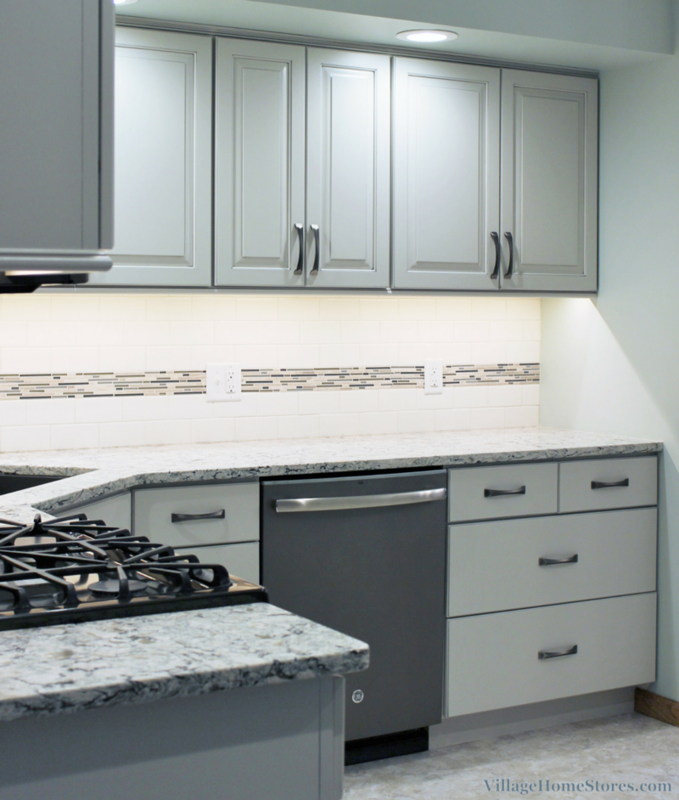 A 3″ x 6″ Subway tile in a white gloss finish is accented by a band of “Aqua Mix” glass and stone deco tile. A corner sink is not something we have shown that often here on the blog. They do continue to be a great option for certain projects. With proper planning and space, you can still get a double-well sink in a corner sink configuration. This under-mounted Elkay sink is what is considered a 50/50 configuration. This means there are equal sized compartments. 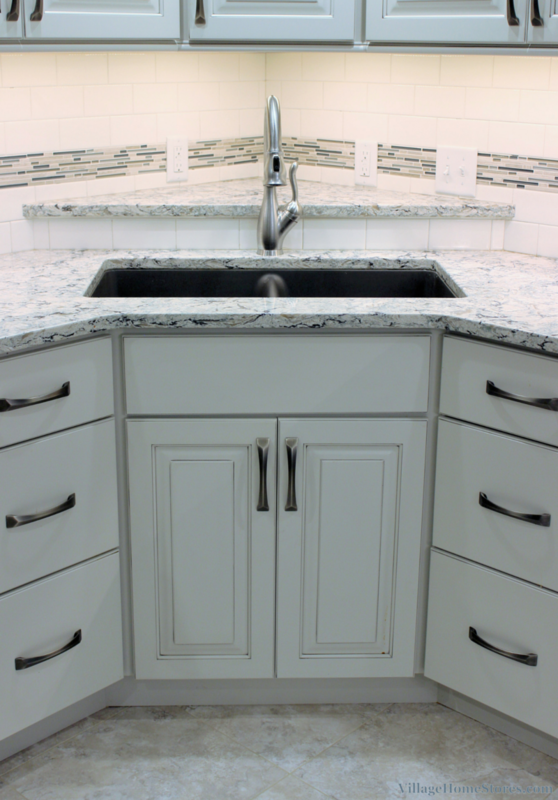 Egranite composite sinks are extremely durable and offer a great alternative to an undermount Stainless Steel sink. Available in 5 color options and many other layouts and sizes, Egranite sinks are a great choice for your kitchen sink. 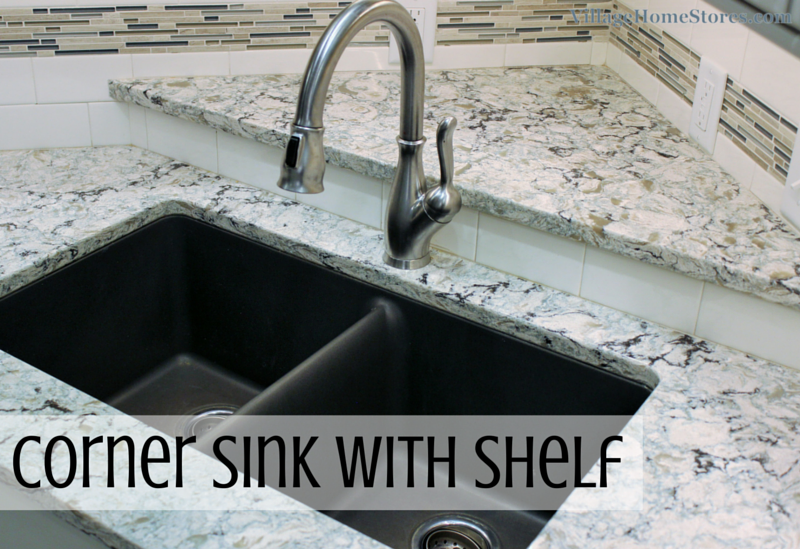 Corner sink installations also give you the available space for a shelf in the corner behind the sink. This elevated area can be used for a number or tasks and the shelf ads a little easier access to the area. The small surface between the sink countertop and the raised shelf can be covered with either tile (shown here) or a small piece of your countertop material. Because the sink is located in the corner of this kitchen, a long span of countertop space is available on the main wall. Anyone with limited counterspace in their own kitchen can take one look at this stretch of workspace and may get just a touch jealous. The counters aren’t the only great thing about this wall. The cabinet on the far right is full of great storage. The split- top drawer section of this basecabinet has been fitted with a Tiered Cutlery Divider from Dura Supreme. 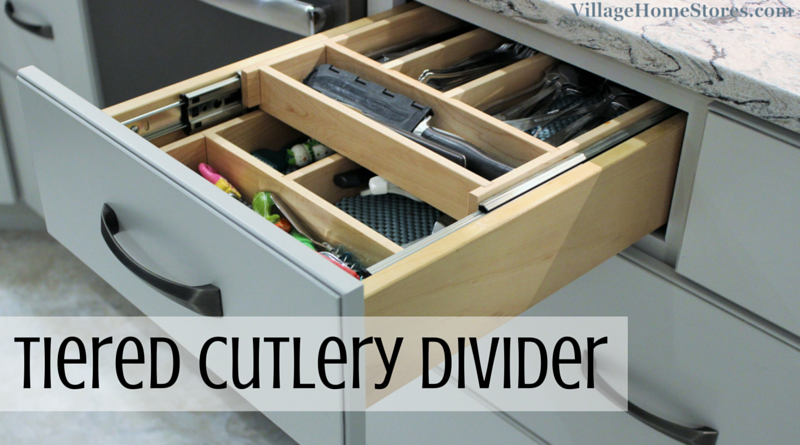 This feature gives you full access to the entire drawer area and keeps utensils organized. Below that are two large drawers that work great as Pots and Pans Drawers. 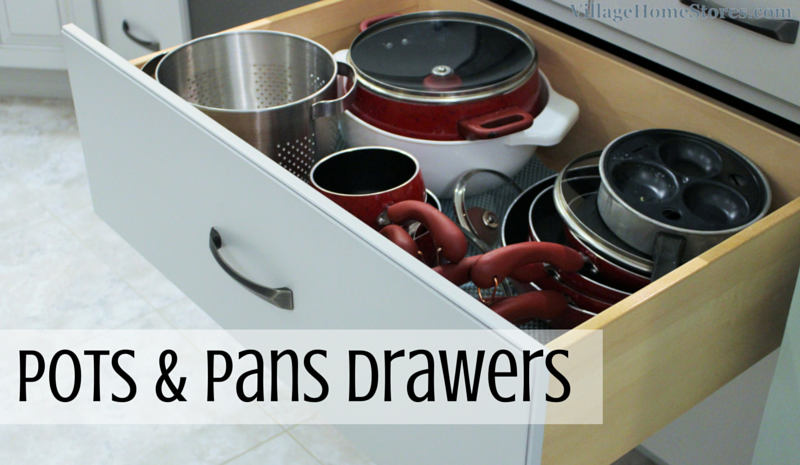 Keep pots, pans, and their lids all organized in these wide drawers. A Tray Divider cabinet may be a standard and expected item to see in any new kitchen but take note of the size of this one. 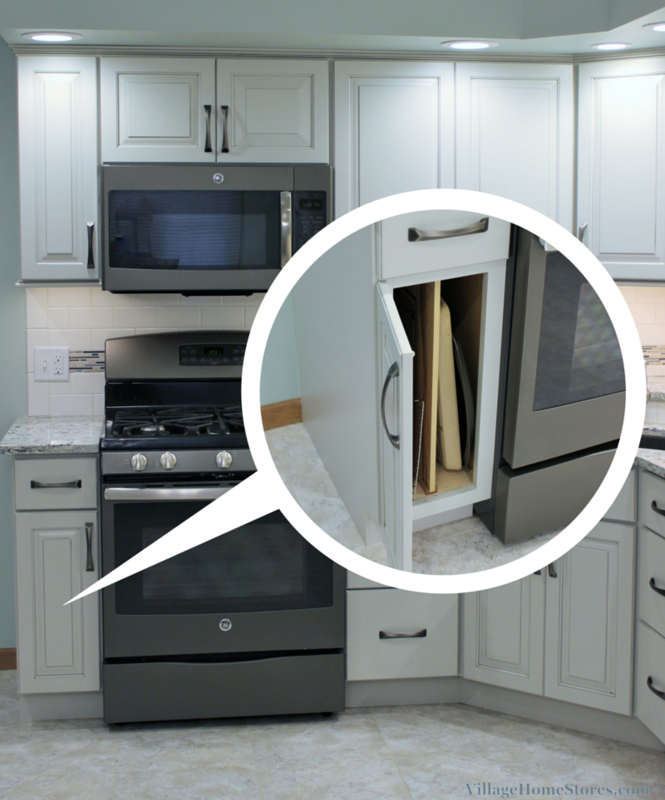 Many times a narrow 9″ cabinet can be enough space for storing your baking sheets and trays. Because of the location of this cabinet, a wider tray divider was selected. With Dura Supreme Cabinetry our designers can call out the width desired and they are not limited to “standard” 3″ increments. This wider cabinet now gives the user at the cooktop more landing space on either side of the range. We mentioned earlier that we did not do to much construction to the main space of this kitchen. The soffits above the wall cabinetry remained. A custom look was still desired for the wall cabinets. Similar to what we would do in the case that your cabinets reach all the way to the ceiling, a full-sized crown was specified for the design. Allowing space for a full-sized crown molding above the wall cabinetry helps give the overall kitchen a more complete and polished look. 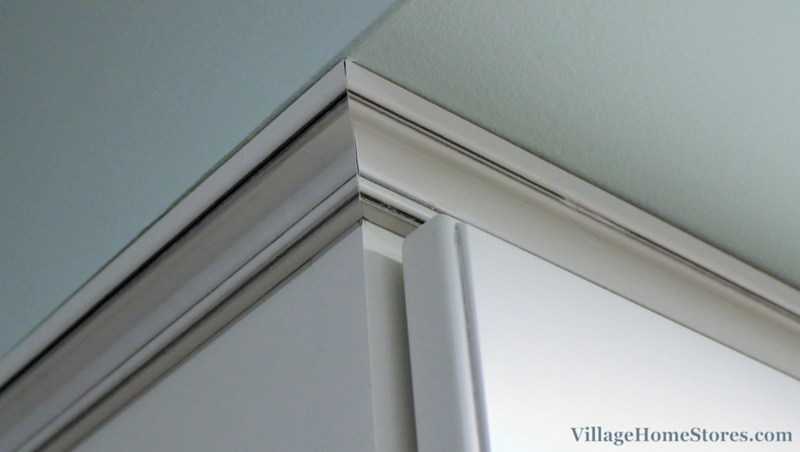 Now the cabinetry looks “built-in” below the soffits. Speaking of a “built-in” look check out the refrigerator wall! 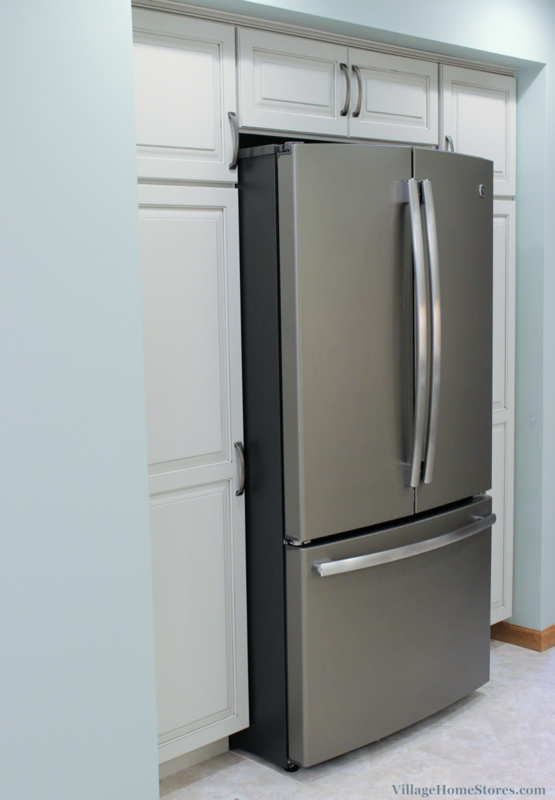 This niche area includes space for a full-sized French-Door refrigerator. Surrounding the refrigerator are two tall pantry cabinets. 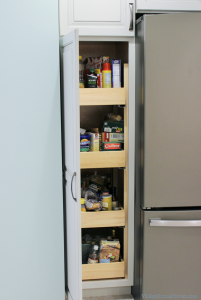 Between the two 24″ deep tall cabinets is a 24″ deep cabinet above the refrigerator. This section of the kitchen now offers so much great storage. Each pantry cabinet is fit with 4 slide-out shelves. 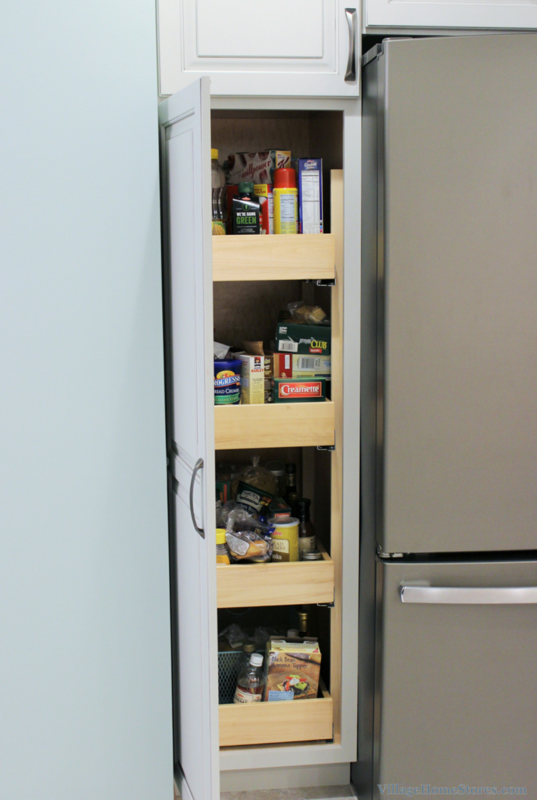 These shelves are perfect for pantry storage because each shelf can be adjusted. Having the option to adjust the height for taller boxes or containers is fantastic. The shelving is also full-extension so you are able to access the entire depth of the shelf when loading and unloading items. The top section of tall pantry/utility cabinets is a great location for small appliances you are not wanting to leave on the counter. Are you ready to start working on your own dream kitchen? 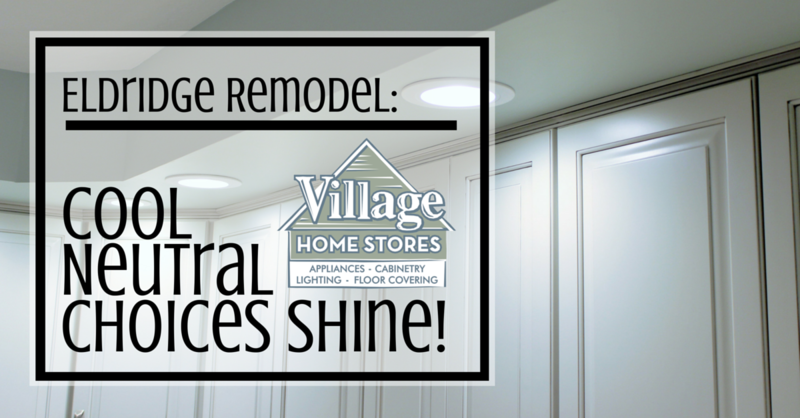 Make an appointment today with our design team to start working on your own Before and After story with Village Home Stores. 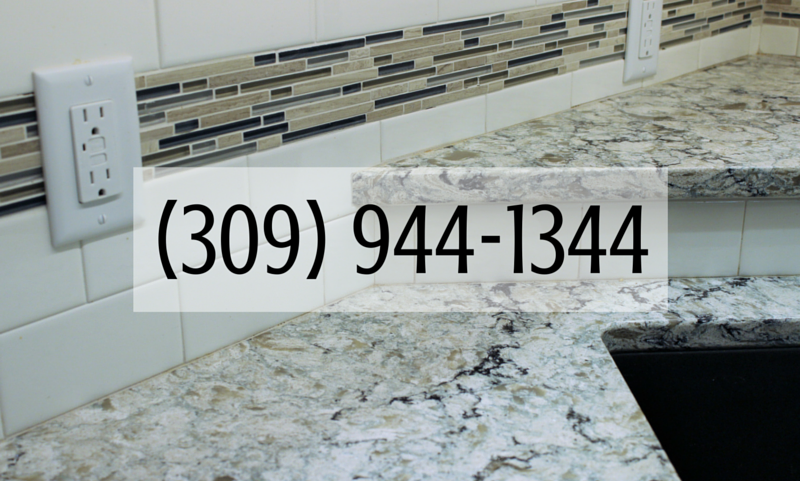 Click here to contact us online or call us at (309) 944-1344.